As you will doubtless know by now, Benjamin has been reunited with Martin Crimp for this, Crimp’s third libretto, and Katie Mitchell, who directed the excellent first staging of Written on Skin, and who has also worked with Crimp on his other theatrical works, has rejoined the team too. This seems, almost a priori, to have given rise to a degree of ennui in certain quarters. (I have tried to avoid hearing what others have thought about the work, but have not been entirely successful.) One objection seems to have been ‘more of the same’, more or less. I can only presume that the same people would have regretted Mozart’s decision to ‘pursue a collaboration’ with Lorenzo da Ponte after Don Giovanni, perhaps even after Figaro. After all, one often hears the most ridiculous nonsense spoken of Così fan tutte. But there is no reason to be defensive here; I only mention the matter since, for better or worse, it is being spoken of already. Upon leaving the theatre, I hastily typed an ‘instant reaction’ tweet, even, for once, remembering to use the ‘hashtag’: ‘#ROHLessons is a towering masterpiece, its intellectual brilliance and sensual wonders matched, at the very least, by its emotionally overwhelming dramatic path. Drained and satisfied as if by Wozzeck or Katya Kabanova; or, the work that increasingly came to mind, Boris Godunov.’ I have no argument with that almost a day later, and shall try to explain why. Are such comparisons less odious than ridiculous? Perhaps. Not entirely, though, since I think this is how we often approach new works, not least in so repertory-bound a genre as opera, perhaps especially with a house and company such as the Royal Opera (House). They are far from exact and the tragic trajectory is not the same; here, in the story of Edward II, it is nicely doubled at the end. Essentially we see (and hear) here Edward’s (never, I think named as such) inability to say no to his lover, Gaveston, resulting in the banishment of the clever, unscrupulous politician, Mortimer, who returns, having manipulated the people to his end, to restore himself in something equivalent to a queen’s coup, ridding the court and realm first of Gaveston and then of the king. But the young king, again not named as Edward III, having watched, with his sister, everything unfold, including that violence which is often yet not always subtly hinted at or stylised, turns upon the usurpers and truly becomes king himself. Tragedy or restoration? That rightly does not quite seem to be the question, just as that bald outline omits the mess of motivations that characterises this horrible, political world. Much is hinted at, there for one to join the dots, but much is portrayed too. The audience member is, rightly or wrongly, treated as an intelligent human being, a participant, not a consumer of Verdi or other tedious kitsch. It is certainly not so straightforward as portraying a situation in which no one is sympathetic. Rather, as in ‘real life’ – and what, alas, could be more real than our present, not so different high or low ‘political’ life? – motivations are complex, contradictory, and, between characters at least, irreconcilable. Such is surely not the least of the lessons of love and violence that unfold – whether one does not believe in love, as Mortimer, or in violence, as the younger young king does not, yet must. Mortimer, after all, schools him, too, perhaps better than he intended. Likewise, Isabel seems – perhaps is – wronged at the start; we can understand why she, a mother and a wife as well as a queen, acts as she does. Yet she is far from white to start with; in her aestheticism – her love of music and her chilling dissolution of a pearl in acid, a pearl that would have given houses to petitioning subjects – she actually seems a good, or rather deadly, match to her husband, as well as a potential rival to Gaveston. There is horror, too, in her children turning upon her, however deserved that turnaround might be. But we must return to music, so beloved of these unpleasant people, yet puritanically or sadistically prohibited by the Young King. (Or so he claims: we never quite know the truth of many claims, for who is narrating? We almost seem to know better in the play within a play, that of David and Jonathan, in which Isabel almost literally begins to call the shots, and in the non-musical reprise of such ‘entertainment’ which is threatened, and yet which turns out to be ‘real’, a tortured Mortimer about to be shot dead by the Young King’s sister.) Yes, we must, that too lengthy parenthesis notwithstanding. For it is music that seems – apparently or otherwise – to structure the words and the drama, or perhaps to re-structure them. It is music that creates them, in many ways, regardless of empirical priority. It also creates, and is created by, the situation: its colour, its tensions, its possibilities. ‘It’, whatever it may be, is always, ultimately, about the music; for when the music stops, so does the opera. Perhaps that has always been Isabel’s fear: the fall of the curtain. Mitchell certainly seems to hint at that, but so do Benjamin and Crimp – and, of course, the outstanding cast and orchestra. Benjamin’s ability to create a sound world has always been one of his hallmarks; in that sense I could not help but think of Janáček and Mussorgsky, both in general and in particular, as mentioned above. Yet, as with those composers, it is certainly not a matter of simply providing atmosphere, a setting, although that certainly is created. Just as Vicki Mortimer’s plush, power-dressing – dressing itself becomes, in true royal fashion, almost a ritual in itself – claustrophobic designs, both for sets and costumes, provide a framework, both to contain and to be broken by the action, so do timbres, often in combination, and harmonies, likewise. There is almost infinite variegation within. The old problem, almost yet not quite Schoenbergian, of reconciling musical antimonies between freedom and determinism, gains new clothes – aural and visual. And the inevitability of the action, at least viewed from the close, of what has happened, takes upon itself an almost Bergian thrust, not least through the characters of and connections between particular scenes. The orchestra follows Benjamin, whether as composer or conductor; or rather, it leads the action with all the confidence and, more to the point, understanding it might once have shown Bernard Haitink in Wagner. And, as with Wagner, still more so with the Debussy of Pelléas, so much action, so much of the truest, wordless action, occurs in the interludes, the transformations between scenes. It is perhaps in those, as in Pelléas, that the stature of Benjamin as a musical dramatist is most immediately manifest. Or does it? Does the orchestra lead? Do not the singers? Yes, they do too. There is much leadership: too much in the plot, just enough in performance. 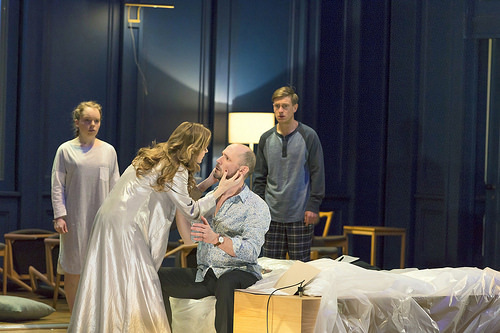 For song, or at least singing, is crucial to this opera; it is certainly not to be defined as a ravishing, horrifying symphonic poem with voices, although it is perhaps partly that. Benjamin and his co-creators and co-performers refuse the either-or that many of us, seeking for a way in to account for our reactions, would seek to foist upon him. 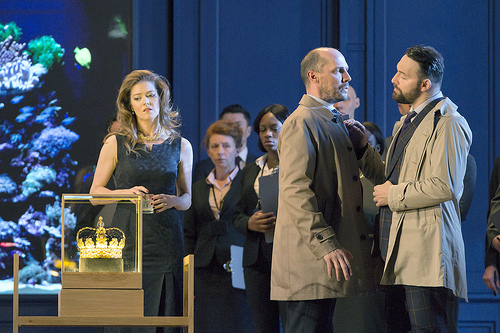 There is drama in melisma: what could be more traditionally operatic than that? There is drama in the entwining and the opposition of melisma? Again, what could take us back more closely to that first zenith of the genre, to Monteverdi? Perhaps the encounter between Isabel and Gaveston, in which she verbally bids him come closer to her, that she might also come closer to the King (who remains distant on stage), is most instructive of all here, for it expresses and creates a musico-dramatic situation more complex than, and still more deadly than, the duet of two baritones so full of sensual delight between the king himself and his lover. Both, and other duets and ensembles, are necessary of course, in the structuring of the drama, just as in the still sorely misunderstood Così. Post-Mozartian Harmoniemusik occasionally seemed to make that point, at least to me; likewise the haunting death rattle avant la lettre emanating from harps and cimbalom, as the Stranger took the King’s life in his cell. The King thought this stranger was Gaveston; so did we, even though he told us he was not, and Gaveston was dead. One could hardly fail to think of the careful, meaningful symmetries of Lulu. And, as with Mozart, although whether through design or through the sheer excellence of these artists on stage, one had the sense that the roles had been written with them in mind. They were, of course, for Mozart, but here, who knows? We are not so much concerned with process, as with each artist having inhabited his or her role. Stéphane Degout’s velvet tones cloaked the impetuous, arbitrary deeds of a weak tyrant, who was also a wronged and wronging man. One made no distinction between role and performance; he simply was the King. 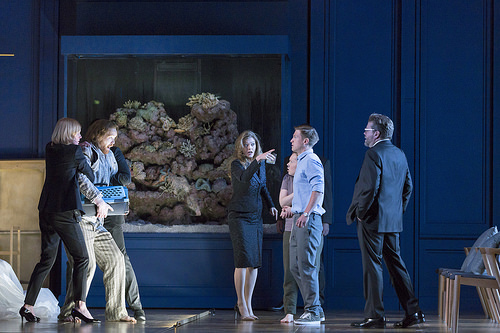 So too, and increasingly so, as her role came into focus, was Barbara Hannigan, as his consort. That she played so well in the initial background speaks just as well of her as the display of that extraordinary ability we all know and love – think, for instance, of her Ligeti – to encompass so many modes of vocal delivery within a single line that remains spun from the same silk. Gyula Orendt’s seductive, nasty, manipulative way with Gaveston mirrored and contested the politician’s path of Peter Hoare’s clever, calculating, just as (in)human Mortimer. Not the least of the evening’s performances was the coming of age through politico-emotional stunting of Samuel Boden’s Boy and Young King. Dressed like a boy, he acted unerringly like one too: almost a Prince William, whilst Diana was still around, or shortly after. Ably assisted by his sister, Ocean Barrington-Cook (a mute role), the crown was, again if only in retrospect, his for the taking – once he had learned his deathly lessons. Smaller roles were all very well taken, by Jennifer France, Krisztina Szabó, and Andri Björn Róbertsson: suggestive of a greater number of voices and faces than was actually present, drawn, as it were, as if from an imaginary chorus. For, as in Boris, we observed and felt the people’s grief, feared equally for what we knew to be their largely hopeless future. As the Third Witness had accused the Queen, in a shocking intrusion, orchestrated by Mortimer, into her chamber, the poor had no choice, unlike the decadent rich, to sleep three to a bed. The miracle here was that fury, both external and internal to the drama of princes and nobles, manifested itself through three single voices, an orchestra, and, not least, an endlessly inventive, supportive, and questioning production. Mitchell too did the work the necessary honour of treating it as a mature drama, as she had in Written in Skin; this was not something to be introduced, hesitantly, but to be directed with the critical modernity she would bring to any other work. This may be a quiet operatic manifesto; such, as discussed, is Benjamin’s way. It may even be a manifesto without intention to be a manifesto. Perhaps that makes it all the more convincing, all the more accomplished. "And, as with Mozart, although whether through design or through the sheer excellence of these artists on stage, one had the sense that the roles had been written with them in mind. They were, of course, for Mozart, but here, who knows?" The leaflet handed out for free at the ROH, containing the cast list and some basic introductory information about the opera, did in fact specifically state that Benjamin had written his score with the specific vocal qualities of these singers in mind. So we do know! Excellent review, by the way. Thank you! It is rather lovely to have had an inkling confirmed like that.